Have you heard about Team SCA? They’re an amazing all-woman sailing crew competing in the Volvo Ocean Race, one of the world’s toughest sporting challenges. Over 250 female atheletes from all over the globe applied to be a part of Team SCA, but only 15 made it. The squad is made up of spectacular women from the USA, Great Britain, Switzerland, Australia, Sweden and The Netherlands. They’be launched off from Brazil and now they’re almost to Rhode Island! This is the first all-female team in this epic race in over 10 years and the only female entry in this edition of the race. I am in complete awe of this incredible team of women. Can you imagine the sheer strength it takes to crew a sailboat in a competitive race out on open waters? The Volvo Ocean Race is a ten-leg race involving nine months of racing across five oceans. Um, does anyone remember when there were only FOUR oceans…and nine planets? Basically, these 15 extraordinary women travel 38,739 miles in their race around the world. They trained for 18 months to get ready. On April 19th, Team SCA left Itajai, Brazil and set sail for Newport, Rhode Island in the 6th leg of the race. It’s a 5,010 mild journey that crosses the South and North Atlantic ocean. While it’s challenging, they’ve already overcome some of the greatest hurdles in the race, including sailing through a part of the Southern Ocean (you know, the “new” one) where the next closet human being was all the way up in the International Space Station. I’ve been checking out the leaderboard on the Team SCA website, and right now they’ve moved into third place. I admit that I don’t know anything about wind knots and what nots, although I’m the granddaughter, niece, cousin and ex-wife of Navy Sailors, but it’s an incredibly close race. I’ll be watching obsessively now to see if Team SCA pulls ahead! Even if they don’t take 1st, what an extraordinary accomplishment to rank so high in such an intense and competitive race! 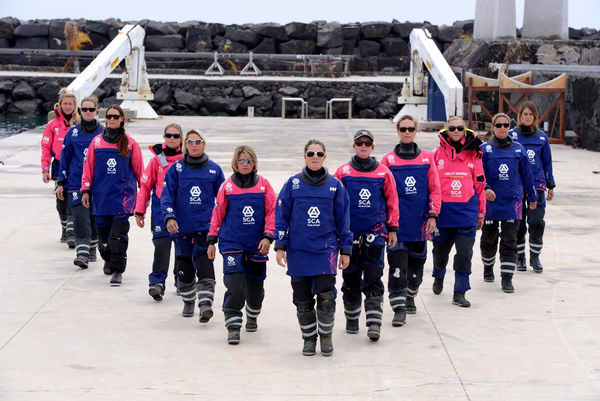 Team SCA is such an inspiration to women everywhere. They tell our daughters that you can do anything you set your minds to and us moms that we really can achieve all our goals, no matter what obstacles stand in our way. Think about it: they are REAL women. Moms, sisters, aunts. Students, co-workers, friends. Real women who worked super hard to reach their dream. Now they’re working TOGETHER to make that dream come true. What a terrific example for all of us. Want to show your support for this amazing team of women? There are a bunch of easy ways to do it. Head to the Team SCA Facebook page and leave them a supportive message. 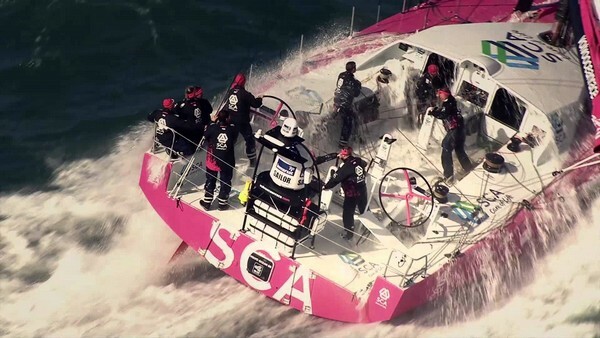 Connect with @team_sca on Twitter and give them a tweet or retweet! Follow the #WeAreTeamSCA to keep up with their news. You can also follow along on Google+ and YouTube! Find out more about the team, their journey and the race at at www.teamsca.com. Have you ever gone sailing? Do you think you could handle a race around the globe with Team SCA?